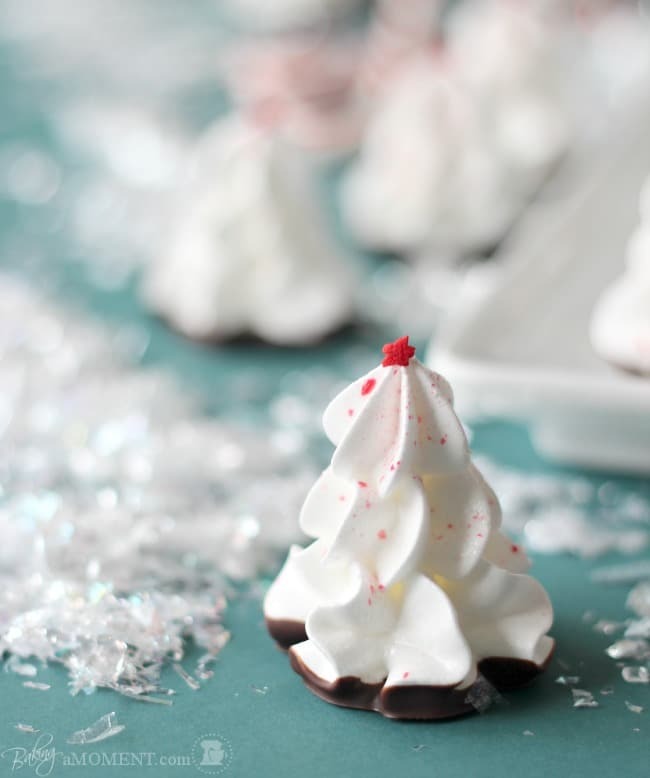 These Frosty White Meringue Christmas Trees are kissed with a touch of Peppermint and Chocolate. A Sweet Topper for Cake or Cupcakes, or a Fun Homemade Gift. Gluten- and Dairy-Free. But I’ll never forget the first time I laid eyes on one of those fake sparkly-white Christmas trees. I think my six year old heart skipped a beat. I don’t know what it is about those but they stir something up in me, even today. I’m always on the hunt for a tempting gluten- and dairy-free homemade treat, especially at this time of year. One of the staffers at my younger son’s preschool has food sensitivities, and I always feel bad for her at Christmastime. She’s surrounded by so many fabulous treats that she simply can’t indulge in! I want to give her something she can truly enjoy, so when I saw this idea, I just knew it was destined to happen, in my kitchen. I used a large star tip to pipe my trees. It’s made by Wilton and it can be purchased here. Also, I had better luck getting my meringue to stay firm with a bit less sugar (a little less than a cup for 4 large egg whites). 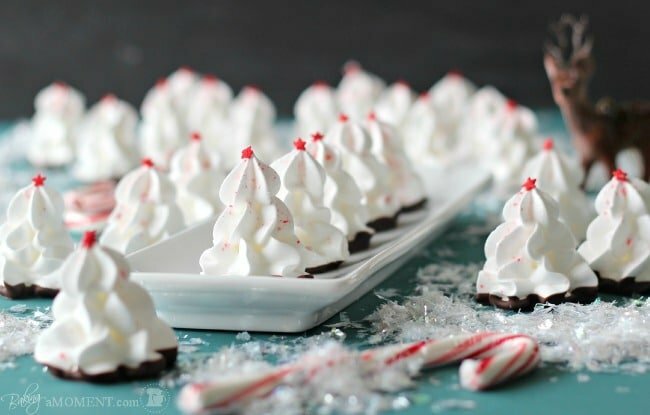 Finally, I sprinkled the trees with crushed up candy canes, for some added bling and wintry flavor, and dipped their bottoms in some melted dairy free chocolate. I don’t know if I’ll ever be able to convince my house full of boys to let me put up a frosty-white Christmas tree all decked out in silver and pink, but when I look at these babies I get that same little thrill. They’re so wintry and snowy-looking! I love the sweet marshmallowy-crisp texture, and that little hint of peppermint and chocolate is so spot-on at this time of year. 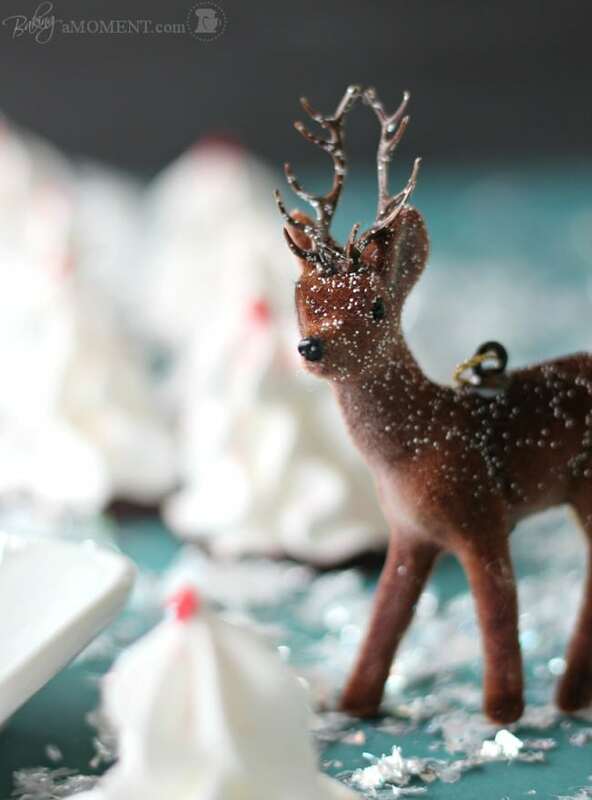 These would look darling as a cake or cupcake topper, or even just lined up on a platter at your holiday get-together. Allie, these are so cute! I can’t get over how fluffy, white and snowy these meringue trees look. And I love the deer! This whole post looks like a winter wonderland. These are so stinking cute! Now you have me totally excited for Christmas! These look GORGEOUSSSS Allie!!!!!!!! 🙂 Soooo festive and wintry! 🙂 That piped meringue!!!!!!! *-* My Christmas baking has suddenly stopped to a halt due to college assignments but I’m going to start soon! And this is definitely topping my list. These meringues are so beautiful Allie! That’s so nice of you to think of making GF & DF treats for one of the staffer’s from your son’s preschool – she will love these! I think my heart just skipped a beat over these too, I love the snowy wintry-effect you created with these chocolate/peppermint goodies. Pinned and hope you have a great week! These are super cute! Perfect way to top a Christmas dessert. Pinning right now! what a cute idea. these look adorable! Isn’t it such a cute idea? I can say that because I didn’t think of it myself 😉 Thanks so much for the sweet comment, Dina! These look SO pretty and festive and light and delicious, mmm! So so gorgeous my dear!! It is winter wonderland and my favorite holiday flavor. I love peppermint and I am now fixated on making a cake just to use these as cake toppers. Wonderful idea, Allie! Love your composition and props in the photos. So festive! I made my first Pavlova this weekend. These are so sweet, I’ll definitely try them:) your photography is beautiful! Thank you so much, June! I’ve really fallen in love with photography and food styling since starting this blog. Thanks so much for reading and for the sweet comment! I am pretty much in love with these beautiful little trees. Great photos and super yummy treats! Thank you so much, Pamela! They were lots of fun to make and I love how light and airy they are. Thanks for reading and for the sweet comment! Oh My – Allie, you make the most beautiful desserts ever, how do you do it?? These are so darling that I don’t think I’d be able to eat them… too pretty for that! Thank you, Consuelo, you are too kind! Thanks so much for the sweet comment. Hope you’re having a fun week! Oh. My. Gosh. What an AWESOME spin! You blew my little trees away girl. LOVE these! Not possible! You are the master, I bow at your feet… Love your idea and your excellent tutorial. It’s just brilliant! Thanks for inspiring me, and I’m glad I could do ya proud. Thanks for stopping by, Toni! I have not made meringues before, but you have inspired me to do so! One question…at what point do you add the star and crushed peppermint on top? Thanks, they are truly beautiful! Hi Stephanie! I pretty much followed Make Bake Celebrate’s tutorial to the letter, with just a few exceptions which were listed in the head notes. So, the sprinkles went on before they were baked. Definitely check out Toni’s page for all the details! Thanks so much and have a great weekend! These are so cute!! 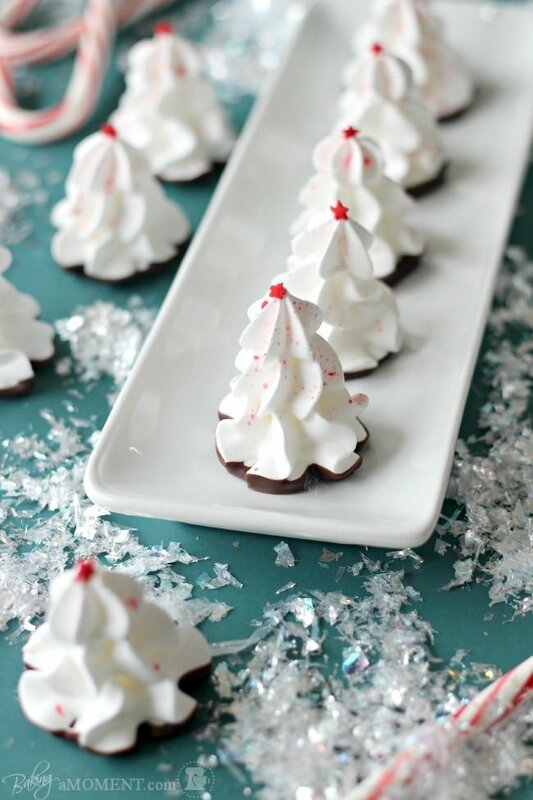 I love how you created the trees out of the meringue, what a great idea! You are so creative! So fancy! Chocolate and peppermint is the best combination ever, can’t wait to try these. Love your pictures as always and that deer! Too cute! Stopped me in my pinterest tracks, Miss Allie. These are stunning. I will definitely try these. Thank you for sharing–Good Apple. Miss Allie, when do you add the little star and the crushed peppermint to the meringues? Hi Melissa! I added the decorations just before putting the meringues into the oven. Good luck and thanks for reading! What size wilton star tip do you use exactly? 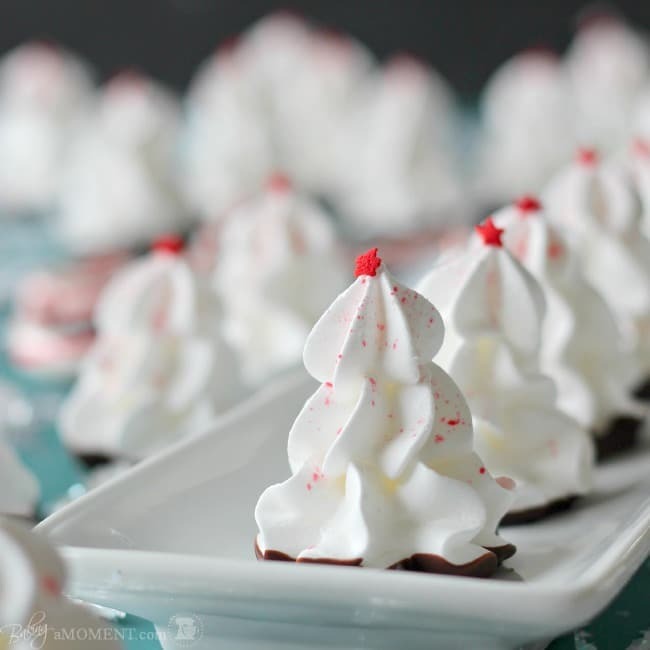 How large are these lovely peppermint meringue christmas trees? Quarter, half dollar or larger? Did you sprinkle with the candy cane after baking in the oven? Actually I did it before. The oven temp is so low it barely melts it, but if you wait until after the meringues will be so dry nothing will stick. Thanks and good luck! Hey Jeana! I don’t know if they’re still available (this post was from last year) but I got them at Michael’s. They were in one of those sprinkle jars with like a bunch of different kinds/colors? Like the seasonal kind. Good luck and thank you for reading! I can not find the recipe. I don’t know the oven temp or what the brown is in the bottom? Hey Cecelia! There’s a link to the recipe within the post. I also mention that the bottoms are dipped in melted chocolate. If you go back and read through again I’m sure you’ll see it. Thanks so much! Very cute. Did you add the crushed candy canes before or after baking? Hi Jennifer! I sprinkled them on before baking. That way they stick better. Thanks for the great question! I’m making these right now and it’s my first time making merengues. When do you put on the sprinkles and star? I’m afraid they’ll melt in the oven for that long. Hi Alisa! You want to put them on before baking the meringues. They will not melt! They are meant to be baked. Good luck and enjoy! 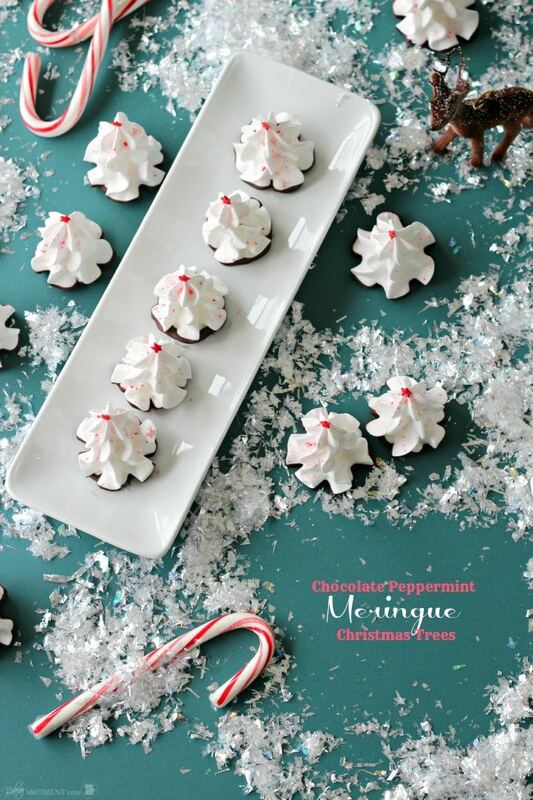 In the Peppermint Meringues Christmas Tree recipie, do you add peppermint flavoring as you’re making them? If so, how much for 4 egg whites? Also, your link to the Dairy Free Chocolate isn’t working. Will you pls respond to my email address? Hi Ann! I did not add peppermint flavoring when I made these (just the crushed up candy canes), but you could certainly do that if you’d like. You can add as much or as little as tastes good to you. I would start with just a few drops and add more according to your taste. And if you search “Dairy Free Chocolate” on Amazon it should yield dozens of results. Hope that’s helpful!